feeling stitchy: October Stitch Along - Kitsch Witch! It's October Stitch Along time and of course it has to be a Halloween pattern! This year we've got a brilliant pattern from Bridgeen from Cherry and Cinnamon, thank you Bridgeen! 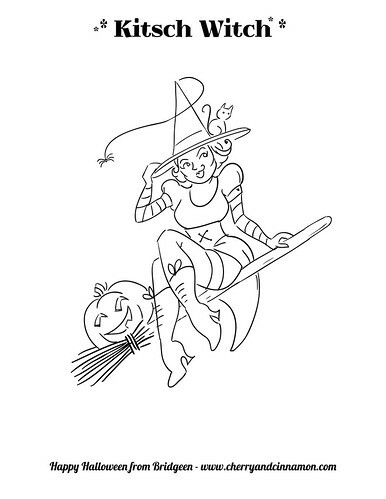 I think the Kitsch Witch is so cute and is a perfectly cheerful way of celebrating Halloween. I can't wait to see what you guys come up with, you can download the pattern here (personal use only). Don't forget to post your wips and finished pics to the Flickr Embroidery pool, using the tag oct2012stitchalong, so that we can find you! She is gorgeous!!!!! Thank you CherryandCinnamon! You are welcome Becky! Can't wait to see your version!